Cover of William S. Haynes Co. Catalog, ca. 1920, from the National Music Museum Archives. NMM 2411. Piccolo in D-flat by William S. Haynes, Boston, 1907. Stamped on body at socket: WM. S. HAYNES / BOSTON, MASS. / 1237. Conical. Two sections. Boehm system. Grenadilla wood body, fifteen silver keys with silver springs. Total length, 339.7 mm. Ex coll. : Fred Benkovic. Board of Trustees, 1978. NMM 2782. Flute by George W. Haynes, New York/East Providence, ca. 1912. Stamped on body at socket and head joint at tenon: GEORGE W. HAYNES / NEW YORK. Cylindrical. Two sections. Boehm system, closed hole, C foot. Cocus wood body, fourteen silver keys (three keys are missing) with 14-karat gold springs. No B-flat lever. Total length, 696 mm. George Haynes probably made his flutes in a workshop at his home in East Providence, Rhode Island. Arne B. Larson Collection, 1979. NMM 3235. Piccolo in D-flat by William S. Haynes, Boston, 1917. Stamped on body at socket: WM. S. HAYNES / BOSTON, MASS. / 4274. Conical. Two sections. Boehm system. Grenadilla wood body, fifteen silver keys with 14-karat gold springs. Total length, 304 mm. W. Wayne Sorensen Collection, 1983. NMM 10461. Piccolo in D-flat by William S. Haynes, Boston, 1918. Stamped on body at tenon: WM. S. HAYNES / BOSTON, MASS. / 4659. Conical. Two sections. Boehm system, separate G and G-sharp keys; no Briccialdi B-flat. African blackwood body, twelve silver keys with 14-karat gold springs. Total length, 306 mm. Played by Frank L. Reed, Jr. (1899-1984) in the Bohumir Kryl Concert Band, the Ralph Dunbar White Hussar Concert Band, and the Al Sweet Band, 1918-1922. Gift of Charles V. Reed, Holmes Beach, Florida, 2003. NMM 10864. Piccolo in D-flat by William S. Haynes, Boston, 1919. Stamped on head joint: [in script] U.S.Q.M.C. ; stamped on body below tenon: WM. S. HAYNES / BOSTON, MASS. / 4916 / [in script] U.S.Q.M.C. Conical. Two sections. Boehm system. Grenadilla wood body, fifteen silver keys. Total length, 305 mm. Gift of Wendy S. Parker, Juneau, Alaska, 2005. NMM 3077. Flute in C by William S. Haynes, Boston, 1919. Stamped on body at socket: THE HAYNES FLUTE / MFD BY / WM. S. HAYNES CO. / BOSTON MASS / 5137 / PATENTED; stamped on all three pieces: USQMC. Cylindrical. Three sections. Boehm system, closed hole, C foot. Silver body, twenty silver keys with silver springs. G trill key. Total length, 639 mm. Gift of Paul Kuentzel, Winterset, Iowa, 1982. Lit. : Susan Marie Beagle Berdahl, "The First Hundred Years of the Boehm Flute in the United States, 1845-1945: A Biographical Dictionary of American Boehm Flutemakers" (Volumes I-III), Ph.D. Dissertation (University of Minnesota, 1986), pp. 487-490. NMM 10460. Flute in C by William S. Haynes, Boston, 1921. Stamped on body socket: THE HAYNES FLUTE / · MGD BY · / WM. S. HAYNES CO. / BOSTON MASS / 6379 / PATENTED; stamped on head joint: WSH [Trade mark insignia] / Co. Cylindrical. Three sections. Boehm system, closed hole, C foot. Silver body, fifteen silver keys with 14-karat gold springs. Total length, 674 mm. Played by Frank L. Reed, Jr. (1899-1984) in the Bohumir Kryl Concert Band, the Ralph Dunbar White Hussar Concert Band, and the Al Sweet Band, 1921-1922. Gift of Charles V. Reed, Holmes Beach, Florida, 2003. NMM 10140. Piccolo in D-flat by William S. Haynes, Boston, 1923. Stamped on body at socket: WM. S. HAYNES / BOSTON MASS / 7300. Cylindrical. Two sections. Boehm system. Silver body, fifteen silver keys with 14-karat gold springs. Total length, 304 mm. Gift of Kim Cosens, Waseca, Minnesota, 2002. NMM 5075. Flute in C by William S. Haynes, Boston, 1927. Stamped on body at socket: THE HAYNES FLUTE / MFD BY / WM. S. HAYNES CO. / BOSTON, MASS / 9972 / PATENTED / REG. TRADE MARK; stamped on head joint: REGISTERED / [Trade mark insignia] / TRADE MARK. Cylindrical. Three sections. Boehm system, open hole, C foot. Silver body, nineteen silver keys with 14-karat gold springs. Total length, 672 mm. Gift of Velma Lentz in memory of Donald A. Lentz (d. 1987), Lincoln, Nebraska, 1991. NMM 9942. Flute in C by William S. Haynes, Boston, 1932. Stamped on body at socket: The Haynes Flute / MFD · BY · / WM. S. HAYNES CO / BOSTON MASS / 12200 / REG'D TRADE MARK; stamped on head joint: REGISTERED / [Trade mark insignia] / TRADE MARK. Cylindrical. Three sections. Boehm system, closed hole, C foot. Silver body, nineteen silver keys with 14-karat gold springs. Total length, 669 mm. Bought by a C. G. Conn dealer about 1935 who was instructed to send it to Robert W. Young, who had just finished his Ph.D. in physics at the University of Washington and been hired by the C. G. Conn, Ltd. Experimental Department, where he carefully copied the dimensions of the flute. Those dimensions then became the factory specifications for the "new" Conn flute that was marketed about 1938. Gift of Robert W. Young, Escondido, California, 2000. Lit. : Stephanie Kocher, "Boehm's Very Good Idea," Flute Talk, Vol. 25, No. 5 (January 2006), p. 15. NMM 4426. Flute in C by William S. Haynes, Boston, 1937. Stamped on body at socket: THE HAYNES FLUTE / MFD BY / WM. S. HAYNES CO. / BOSTON MASS. / 15056 / REG'D TRADE MARK; stamped on head joint: REGISTERED / [Trade mark insignia] / TRADE MARK; inscribed under 'TRADE MARK' in old English letters: J / F / K (Jeanne Francis Kay [Larson], previous owner). Cylindrical. Three sections. Boehm system, closed hole, C foot. Silver body, nineteen silver keys with 14-karat gold springs. Socket next to thumb B-flat key for palm crutch. Total length, 674 mm. Arne B. Larson Estate, 1988. 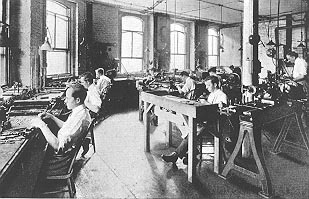 Interior view of William S. Haynes Company factory in Boston from their ca. 1920 catalog. An original copy of this catalog is preserved at the National Music Museum.